Whatever the outcome of the May Election there are only two leaders that can become Prime Minister. Despite falling support for both Conservative and Labout they are still the biggest parties by some margin. Almost every poll suggests that neither will get an overall majority though. The SNP will more than likely be the next biggest party but Alex Salmond won’t form a coalition with the Conservatives and Miliband probably won’t do a deal with the SNP. Despite UKIP’s strong poll showing, that’s unlikely to translate into many seats because of the way support is distributed with very few constituency strongholds for the nationalist party. That may well leave the Liberal Democrats holding the balance of power once again. The precedent that they set in 2010 is that they will enter into discussions with the party that get’s the most popular support. It will be almost impossible for them not to adopt the same policy this time around. Most polls are putting Labour and Conservative neck and neck, In fact the May 2015 Poll of Polls today separates them by just 0.1%. So a swing of 1% either way could decide whether or not Cameron hands the keys to Number 10 to Ed Miliband in May. How General Elections Work in 81 Seconds. Earlier this year the UK Parliament posted a quick, handy video guide to the General Election on their official YouTube channel. Suprisingly there’s a Monty Python reference in there. Can you spot it? 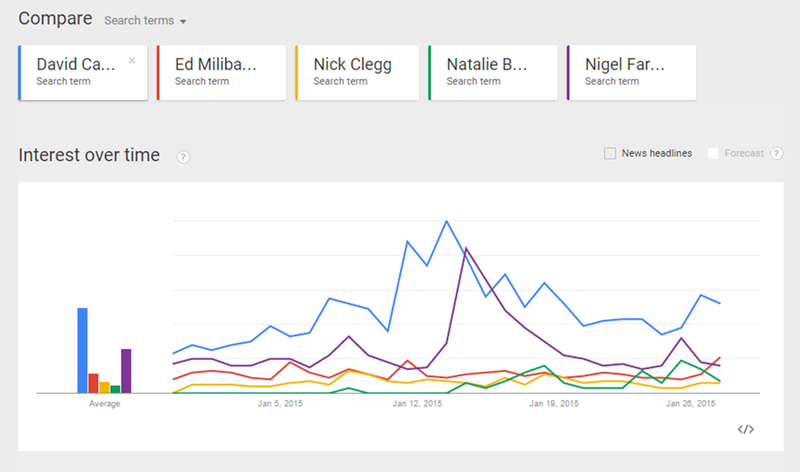 Nick Clegg seems to have dropped off the popular political agenda according to Google Trends. The service is a is a fascinating way of finding out what people are interested in over any given period. Based on Google Search, the Trends site shows how often a particular search-term is entered relative to the total search-volume. It also allows comparisons between search terms. Entering the names of the five main party leaders produces some interesting results. Cameron is way out in front which is not too surprising for a sitting PM. Nigel Farage is a good second place suggesting that the media obsession with the UKIP leader is reflected in public interest (chicken or egg?) Miliband is a poor third but the Deputy PM is neck and neck with Green Party Leader Natalie Bennett, someone with up until now a profile so low it was almost invisible. Although over the whole of January there have been more searches for Clegg, in recent days the Green leader appears to be overtaking him. That’s a worrying trend for the LibDem leader. Twitter stole a march on social media rivals when it announced yesterday that ads and promoted tweets will be able to be geo-targeted down to individual postcodes for the first time. Facebook can target towns and cities but not streets or significantly in the run up to the election, individual constituencies. For political parties fighting at constituency level, where the race to win a seat is likely to be close, targeting by postcode could prove to be a powerful weapon in the digital armoury. Postcode targeting gives candidates an opportunity to push policy on local issues or raise the profile of a candidate fighting for a seat for the first time. The ability to target audiences at hyper local level is added to existing options that include interest, gender and keyword targeting. In an election that will be fought hard with more battleground constituencies than ever before this could give candidates with skilled digital advisors a real advantage. We the enter final 100 days in the run up to the 2015 UK general election. It will be unlike any other election in history, not least because we know that it will be on May 7. For over a 100 years we’ve had a maximum term of five years but few parliaments actually lasted that long. Before the current coalition government introduced the Fixed Term Parliament Act an election could be called with as little as 17 working days notice following the dissolution of the Parliament by the Queen. A typical election campaign lasted just a month and usually the incumbent Prime Minister chooses to call a general election at a time when they believed they have a lead in the polls or a comparative advantage. It will also be the most complex and unpredictable election in modern history. The combined Tory and Labout vote is lower than it has been since 1922 the first election in the UK and Norther Ireland (after the Irish Republic came into being). With the Green Party, UKIP and the SNP all gaining increased support the next 100 days will see an election campaign like no other. With just over 100 days to go before the UK 2015 general election on May 15 the ‘Politics10’ blog that was created for the 2010 election has been completely revamped and relaunched today with a new name Ballot Blogs. There will be regular posts in the run up to the election covering every aspect of the campaign and taking a particular interest in what’s going on online and in social media. You can book mark the page, follow on Twitter or sign up using the subscription box on the right.